I adore this recipe! 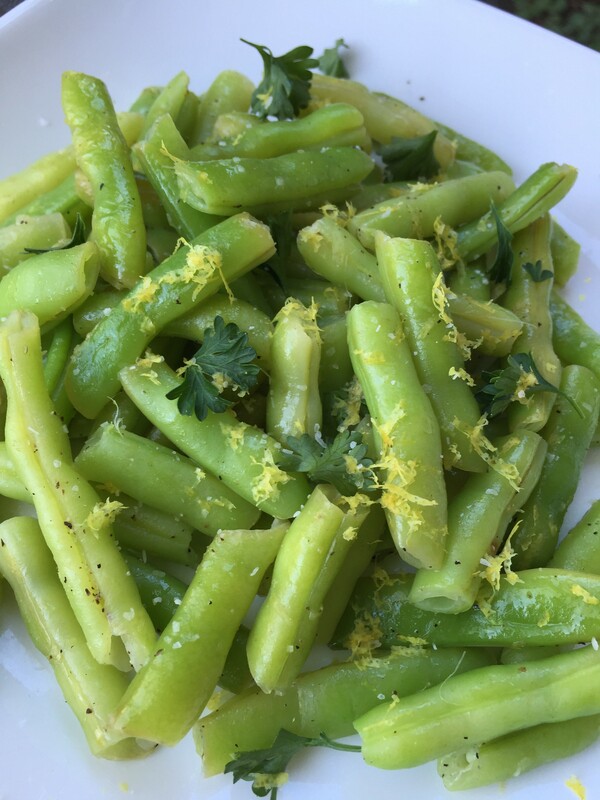 We love green beans no matter how they’re cooked, but this one for green beans with lemon butter is terrific in a bunch of ways. It’s incredibly fast, and if you blanch off the green beans ahead of time, it literally takes less than five minutes to put together. We have green beans all the time, and I think over the past 20 years I’ve come up with just about every way to cook green beans there is. I started out in my teens making them the way my mother did – with bacon drippings and an onion, and cooking them for hours until there was no color left to them. And I’ve still never been able to duplicate my Aunt Betty’s beans – although if that day ever comes I’ll probably die happy. But green beans are so nutritionally packed I wanted ways to cook them that gave some variety, and that also preserved far more of the nutritional value than the ways I grew up eating them. So I began experimenting with roasting, sauteing and blanching them. Or in this case a combination of two of those techniques. minutes in the boiling water. After that they really only need to be warmed with the seasonings – in this case a bit of butter and fresh, bright, lemon zest. If you’ve been looking for new flavor combinations to bring to your family table, try this easy recipe. It’ll quickly become a favorite – I promise! In a medium saucepan over high heat, bring lightly salted water to a bull boil. Add beans and cook until crisp tender, about 5 minutes. Remove from heat and drain. Return beans to saucepan, add butter, salt, lemon zest and pepper. Add lemon juice. Toss well to combine. Serve warm.